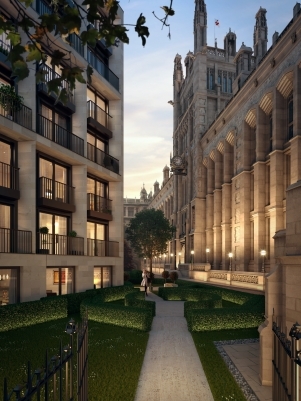 St Dunstan’s Court is a high-end apartment development in the heart of The City of London. 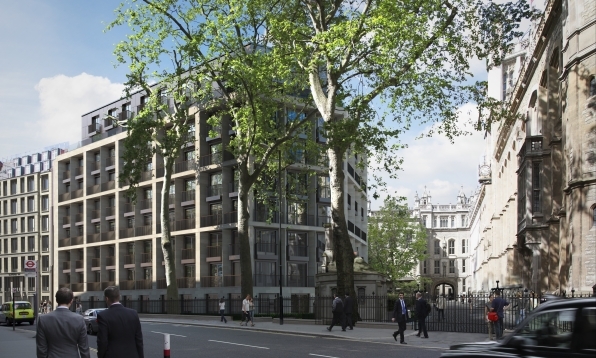 The scheme has seen the sympathetic transformation of the former headquarters of Her Majesty’s Court Service into an outstanding residential development which sits with confidence alongside landmark historic buildings. 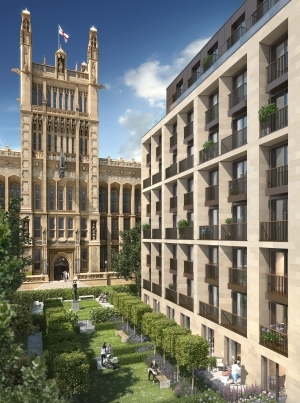 Located in the City of London’s Fetter Lane, opposite the neo-Gothic splendour of King’s College’s Maughan Library, it was crucial this 76-apartment development would both respect and sit with confidence within the local neighbourhood. Dunhouse Buff, a fine grained creamy sandstone, provides the exterior of this nine-storey building with a contemporary feel, while its naturally occurring features and markings, plus its weathering over time, allows the structure to take on a homogenous appearance and blend in with the surrounding environment. The building benefits from a leafy setting, with fine protected mature trees within the secluded communal landscaped gardens. This green oasis in the heart of the City comprises formal gardens and a less formal meadow for relaxing. Inside, St Dunstan’s Court exudes opulence, with interiors inspired by high-class international hotels. The lobby benefits from a 24-hour concierge service, while a residents’ lounge in the basement provides a formal meeting room and break-out areas for residents who wish to bring their work home with them, and a more relaxed area, ideal for City professionals who want to enjoy lunch with their family. The 24 two-bedroom apartments and 52 one-bedroom designs benefit from a luxurious specification, while floor-to-ceiling windows flood rooms with natural light. Many of the homes benefit from a private balcony, while those lucky enough to live in one of the duplex penthouse apartments enjoy large private roof terraces with incredible views across the capital. Meanwhile, outside in Fetter Lane, listed railings on the site’s boundary have been treated and an original red telephone box has been restored. Secure bicycle storage is provided for residents, who benefit from a sustainable location that is within walking distance of the City’s commercial centre and three underground stations.